Ocean observatory work crosses many science and engineering disciplines. ESONET and EMSO draw on a range of science programmes. Working together they aim to transform the way in which ocean data are collected. Combining observatory networks will greatly advance ocean science in Europe. Improving access to data will enhance the ability of researchers and others to study and monitor our changing environment. The European efforts will join globally initiatives, e.g. GEOSS and GMES. Combining ocean observations with seismic, climatic and other data centres will help us tackle climate change, the exploitation of natural resources, and the monitoring and prediction of environmental hazards. 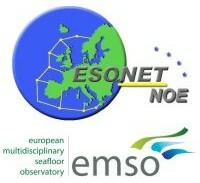 Particularly essential links exist between the integrating, networking, and planning programmes ESONET and EMSO and the research programs EuroSITES (European Ocean Observatory Network) and HERMIONE (Hotspot Ecosystem Research and Man's Impact on European Seas). These programs are conducting active research at many of the proposed ESONET and EMSO sites. EuroSITES and HERMIONE, along with most other programs, however, rely on iterative funding. ESONET and EMSO aim to transform the way in which data from the ocean and deep-sea are collected to ensure that the information achieves the needed continuity to address the oncoming research challenges. ThermoHaline Overturning - at Risk?